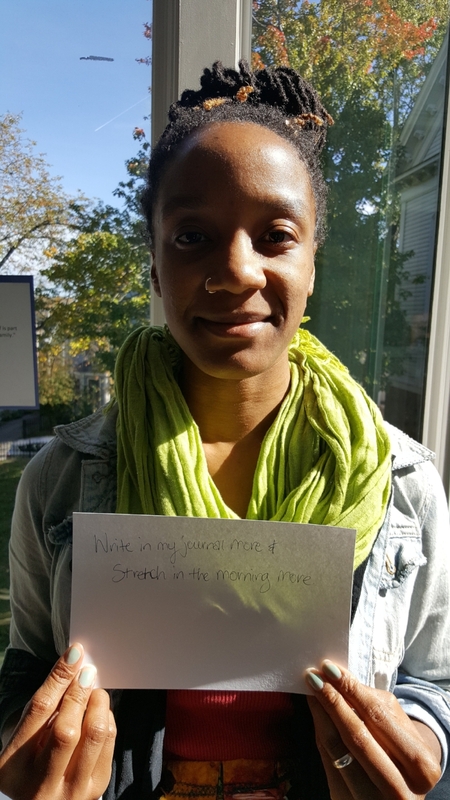 Makeda, a First Teacher participant, showing her self-care goals. On Saturday, October 15th, First Teacher held our first workshop of the year at the Unitarian Universalist Urban Ministry in Roxbury. The welcoming space, with floor-to-ceiling windows inviting in a beautiful view of trees dancing in the wind and the sun shining through set the tone to discuss the ever important topic of Self-Care. Prior to the start of Self-Care Shop, 0ur amazing parent and caregiver participants spent time with one another enjoying a light breakfast while their children were well taken care of in a different area. Although several parents opted to keep their little ones under the age of one in the workshop, they had the support of other parent and caregiver participants who were more than willing to hold and rock their babies. I am more than happy to report that particular response was not shared by any of the parents or caregivers. Instead, responses included - mental clarity, meditation, a break, me time, and peace. Clearly, there is an understanding of self-care in this group of wonderful women. Understanding is the easy part; the real challenge many parents and caregivers face is implementing self-care in our lives. So why not put it into practice, and see how it’s possible - with minimal effort and time. Breathing exercises are calming and soothing, especially during stressful times - for us and our children. Together, we practiced an exercise using serene music and deep breathing. It was a perfect way to start. We spent the rest of the workshop sharing and reflecting on how we already care for ourselves and in doing so, model for our children and prepare them for school; exchanging ideas of easy self-care practices, and setting one or two goals for ourselves. Remember, we are the most important people in our children’s lives, and caring for ourselves is crucial. Let us love ourselves as we love our children.